Chocolate and navy beans – not usually ingredients that go together. I’ve said it before and I’ll likely say it again because they’re amazing – beans and legumes are SO underrated when it comes to desserts. They’re virtually tasteless when you add other flavours, give a great texture to many recipes and are packed full of protein, which means you don’t get a sugar slump after eating dessert. I don’t know why they’re not used more considering how cheap they are, but I love them and after making this recipe I hope you will too! This Chocolate Navy Bean Mousse is really delicious. 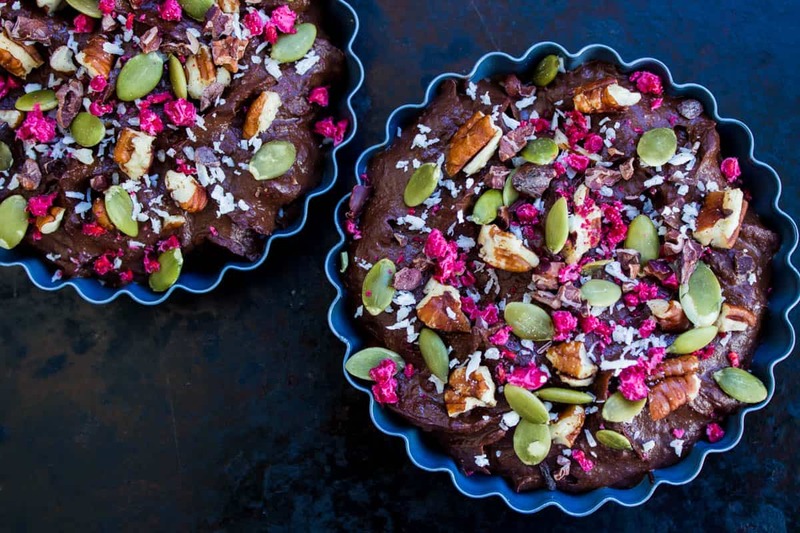 I’m always looking for ways to create healthier desserts without compromising on taste and this one is just so good – I could eat it each day. The beans provide protein and vitamins, and the cashews and avocados make it taste creamy. It’s easy to make and just requires a high speed blender or food processor (this bit’s important otherwise you’ll end up with a lumpy mousse which believe me, you won’t want to eat). I recommend using dates and maple syrup but you could just use maple syrup if you can’t be bothered with blending the dates to a paste or if you’re short on time (if you do this, simply blend all ingredients together at once). 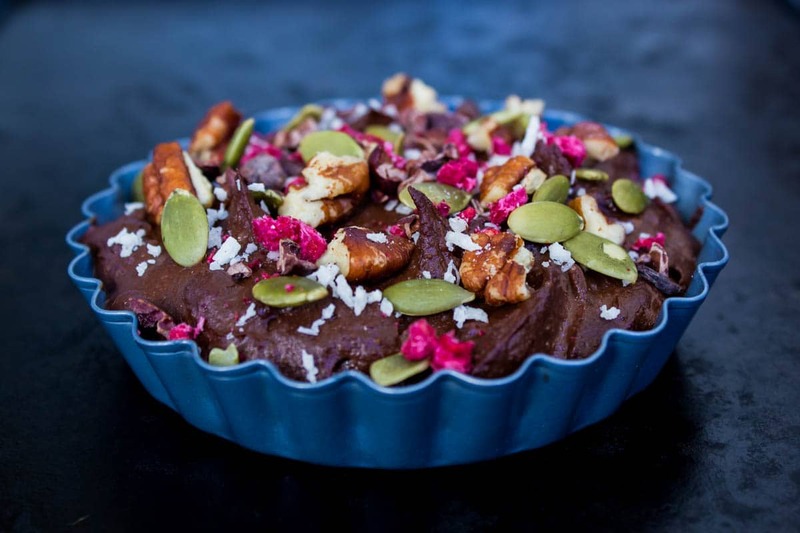 The beauty of this recipe is really in the presentation – you can decorate it with whatever you like, but for these images I’ve used freeze-dried raspberries, shredded coconut, pumpkin seeds, pecans and cacao nibs. The key is colour! Berries, dried fruit, nuts and seeds work really well as decorations. You can freeze thisChocolate Navy Bean Mousse, though if you do I recommend covering it and only decorating once you remove it from the freezer. Enjoy! Add the dates, melted coconut oil, water and maple syrup to a blender or food processor and blend until you have a relatively smooth date paste. Add all remaining ingredients and blend on medium to full power until a really smooth texture forms. Spoon into ramekins or bowls, decorate with your favourite toppings and serve. Store any remains in the fridge, covered, for up to five days. Disclaimer: if you’re a regular to this blog you’ll know that I like chocolate (understatement). 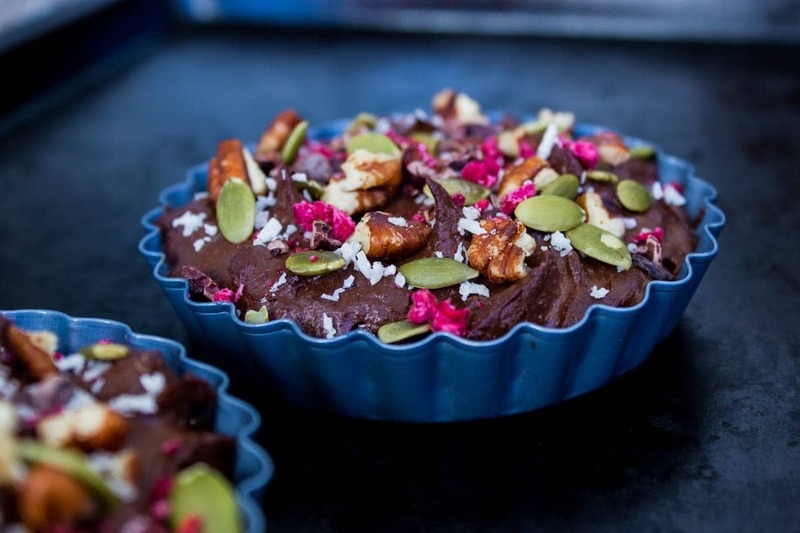 This is actually the third chocolate mousse/pudding recipe I’ve posted – each one uses slightly different ingredients so you can pick the best one to suit your tastes/cravings/moods. Go find them here.